When it comes to vinyl flooring options for your home, office building, store, or other commercial property, place your trust in the friendly and knowledgeable staff at our flooring superstore to help you find the ideal choice. Our flooring store has countless displays and examples of our vinyl sheet flooring on hand. Visit us to peruse and rely on us to help you find the floors that best suit your needs in looks, performance, and price. Whether you want to add vinyl tile flooring to the rooms of your house or you need want you install vinyl plank flooring throughout your office building, you can find the assistance you need at our flooring store. No matter what type of vinyl floor material you need for your property, we provide the appropriate vinyl floor installation services. Invite us into your home or place of business and see the difference that our experience can make for your floors. Why waste your time and your hard-earned money on vinyl floor installation when you can hire the skilled and experienced crew from our flooring store instead? We have years of experience in installing all types of vinyl floor, so let us add vinyl tile, plank, or sheet flooring to your building. Because we know that your time is valuable, we work around your busy schedule to make sure you receive the quick and efficient installation services you need. We work diligently to install everything properly the first time, and we pride ourselves on how little we impact your daily home or work routine with our installation solutions. Vinyl sheet flooring is one of the most popular types of flooring that we sell and install. Combining style, durability, and ease of care into one unbeatable package, this flooring remains one of our best sellers. Vinyl sheet floors are easy to maintain because all you need is warm water and mild soap to remove most spills and stains. 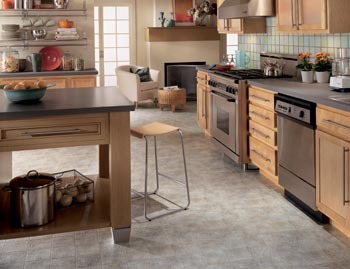 Perfect for busy households, this type of vinyl flooring goes well in areas that receive high amounts of traffic. The claws of your pets and the little feet of your children are no match for these durable, strong, and beautiful materials. Emulate the look of hardwood floors at a fraction of the cost with our durable and affordable vinyl plank flooring. Available in a wide range of colors, styles, and patterns, these plank floors can add a touch of class to any room in your office or home. In addition, we also sell and install vinyl tile flooring that can completely change the décor of any room for the better. No matter what type of floors you need, you can find an affordable option at our flooring store. Contact our flooring company for more information about our vinyl flooring. We sell and install vinyl sheet, tile, and plank flooring for clients in the communities of Seaside, Astoria, Cannon Beach, Manzanita, and Gearhart, Oregon, as well as on the Long Beach peninsula.